I ended up reviewing the Diamond Horseshoe by accident. I got a last minute, late lunch booking at the Liberty Tavern. The issue came up when we wanted to order from the a la carte menu. Because on the exact moment they switch from lunch to dinner, it is all-you-can-eat buffet only. They were nice enough to get us a table at the Diamond Horseshoe, but I thought I might make that known to any others who weren't savvy. The hall itself is beautiful. Country ornate wasn't a style I was familiar with, but I definitely see the appeal. A grand staircase leads up to the second level, but on the Saturday we were there no one was allowed up them. A beautifully lit stage is the centerpiece of the hall and I cannot tell you how disappointing it is to eat a meal while nothing happens on such a wonderful stage 20 feet away from your table. I blame Disney, they've created such completely immersive experiences that I probably expect too much. You should hear me complain about fireworks without matching music and flying fairies. If I'm being honest, the service is so-so. I found our waiter disinterested and many of the staff would stand on the perimeter talking while diners desperately waved for their attention. Maybe it was just an off day. When it came time for dessert, I had suffered the empty stage and waiting too much. We decided to switch hit and head over to Gaston's Tavern. In many ways it was a saving grace for our overall experience, as Gaston's is an entertain-yourself establishment. After getting our sweets, we sat in the trophy room and sang along with all the great things about Gaston. It seemed that a reduction in expectation of entertainment and service lead to greater overall guest satisfaction. Or at least that's what I told the guy who took my survey on the way out of the park. Carved Beef Brisket (served with cornbread and your choice of two fix 'ins): We actually ordered two of these so we had four sides. 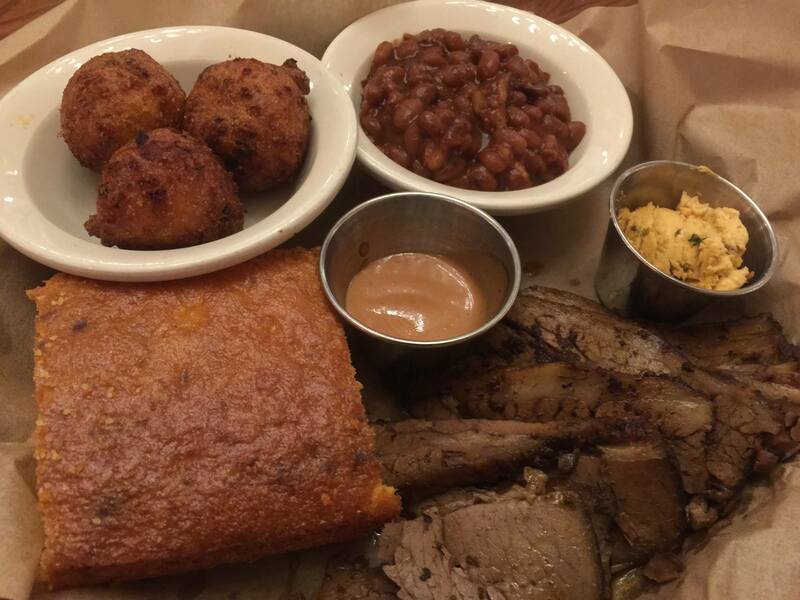 The brisket was very good, fork tender and with ample seasoning and smoky goodness. The barbecue sauce it was served with was equally well matched and I was really impressed with the quality of the brisket. We selected the beans, corn, fruit salad and corn fritters. The beans were flavorful and hearty, really about all you could ask out of baked beans. 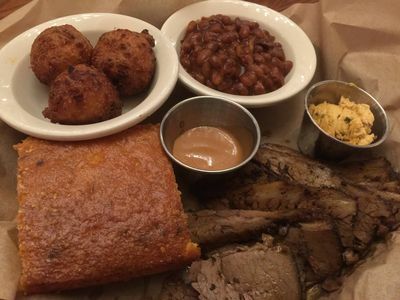 The fritters were good, but sort of redundant with the jalapeno cornbread that comes with the meal. The corn was excellent, though the smallest portion you can imagine. The salad, well, I know tomatoes are a fruit. But to have tomatoes comprise 75% of a fruit salad should be considered a crime against humanity. At least we should have been warned. 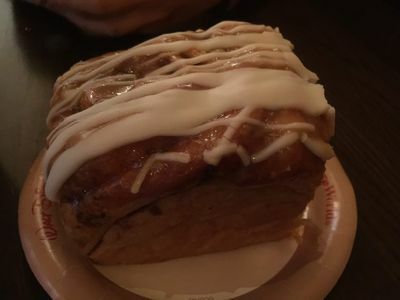 Cinnamon Roll: Thick, almost too thick but well drizzled with frosting and cinnamon glazing. More than enough to share amongst friends. 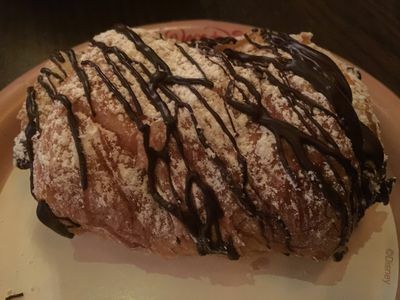 Chocolate Croissant: Light flaky crust stuffed with a decadent chocolate, dusted with powdered sugar and drizzled with more chocolate. If you don't like this, you don't like chocolate. 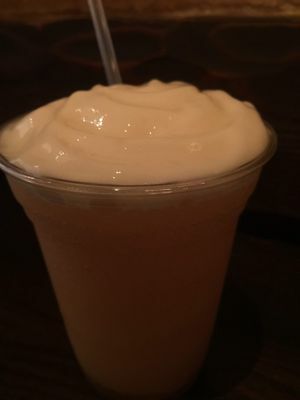 LeFou's Brew: Frozen apple juice with a hint of toasted marshmallow and topped with all natural passion fruit – mango foam. This is the Alpha and Omega for frozen treats for my son. Better for him than a Dole whip, Butterbeer and Micky Mouse ice cream bar combined. Dad (43): 4.3 of 5—Toward the bottom of my picks for Magic Kingdom. But it might be a good choice if you've never experienced it. I would suggest waiting for a time when there is a show, how you find that out is knowledge I haven't discovered. 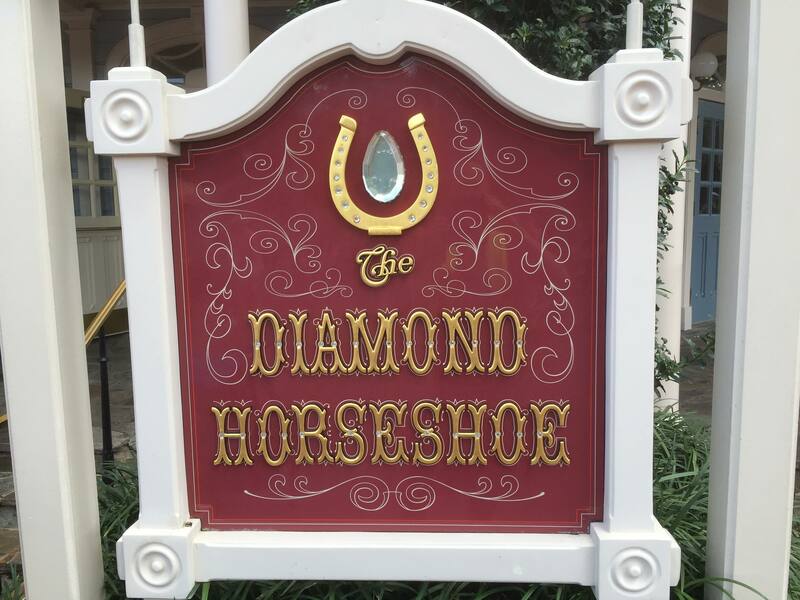 Mom (43): 4.4 of 5—Really enjoyed Gaston's tavern and the food at Diamond Horseshoe was all very tasty. Daughter (20): X.X of 5—Not present. Son (18): 5.0 of 5—Real meat goodness followed by a LeFou's Brew, what could possibly be better? Nothing. Thank you. 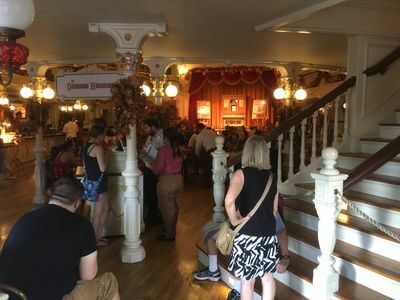 We had the exact same experience at the diamond horseshoe. It seems almost like a “pop up” eating location. That someone decided to move some tables and chairs into an abandoned theater used for prop storage. We did enjoy the food, but being a couple, the amount they brought us was way too much for two. The service we had was good, but could not overcome the abandoned feeling. 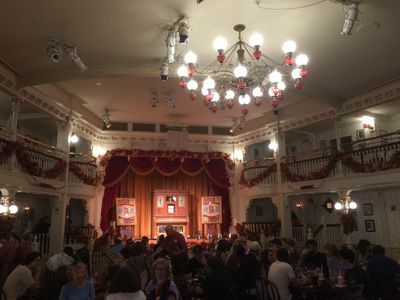 Such a difference from the Golden Horseshoe, which usually has some sort of show. We would not pay the high cost for the lack of show and the waste of good food that we couldn’t eat all of. Maybe larger groups would have a better time, and be able to do justice to the food. And what is it about servers that stand around instead of serving? And then when they do serve, the food is warm not hot. It is universal. What are people thinking when they stand around instead of doing their job? And now places have food runners instead of servers doing that horribly difficult task of serving hot food to customers. This is not just a WDW issue. Everywhere I go, I see servers shooting the breeze with their buddies while trash and used dishes sit on my table. The best part is when they stand near the swinging doors and you see them kibitzing when people go in and out with orders. 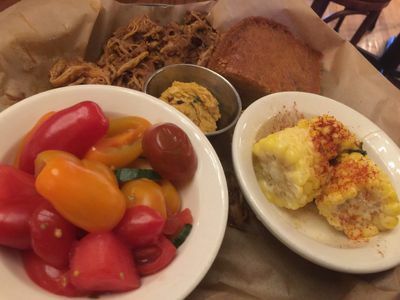 We had a recent experience at the Brown Derby where our server was just doing the basics and it was so out of the ordinary that we had to comment to the manager. So many waiters and waitresses won't even pick up the straw paper from the table. But they get to gossip with their buddies on company time!